This entry was posted on October 20, 2012 at 12:44 pm	and is filed under Sathya Sai Baba. Tagged: Puttaparthi. You can follow any responses to this entry through the RSS 2.0 feed. You can leave a response, or trackback from your own site. With a little commonsense, one could have realized that Puttaparthi is a one hit wonder propped up by SB’s ability to draw crowds. But business people turned a blind eye to this simple reality and didn’t scale down or bail out when his health took a severe down turn. Wasn’t he in a wheelchair for 4-5 years at least? That was ample time to prepare an exit strategy. But these people (the realtors specifically) wanted to cash in as much as they could turning a blind eye to the strong possibility that the end is near. Business goes through boom and bust cycles – business people who identify the cycles early do well. Those who don’t, well……. Well said! Common sense in Prashanthi always took a beating from ‘divine sense’ (which amounts to ‘non-sense’ and a denial of all sense attractions too!). When the airport was built at public expense and not used for a long time except for the occasional government visitor – then once weekly or so (with extra at big bashes like birthdays and Christmas) – anyone could see that it was totally dependent on when and where Sai Baba happened to be. The Sai Central Trust had been ‘gifted’ the airport and then tried to capitalize on it, putting on the market. It was a drug on the market… no one showed ANY interest. 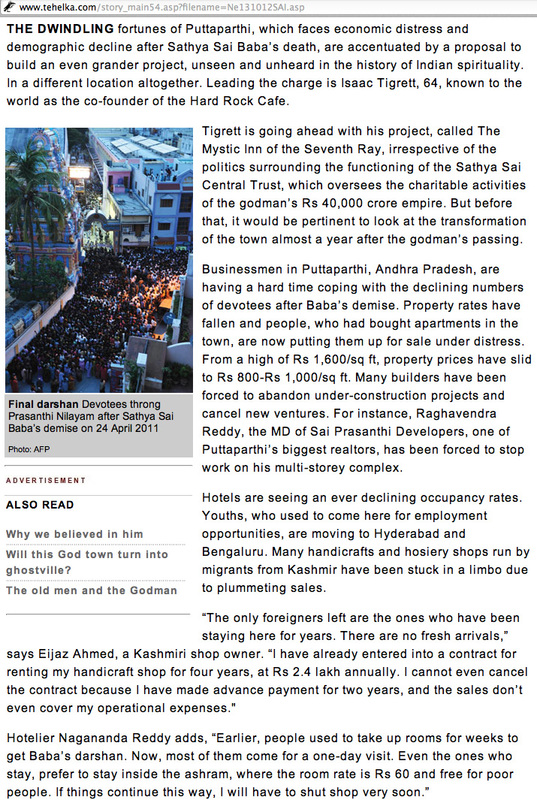 That alone should have warned everyone about the fragility of the Puttaparthi economy, but no… property developers went on builging (on the flood plain too, which was a madness that foreigners would not notice! ).